Ok, so let's get back to fabrics 5 and 6 from the original post in this series. Fabric 5, a jersey, has multi-colored floats on the technical back. I'd most likely use this side with the floats as my "right" side, though I do think that the knit side would also be fun with its slight ripply surface. I thought it would also be fun to slow you what can happen when floats go wild. 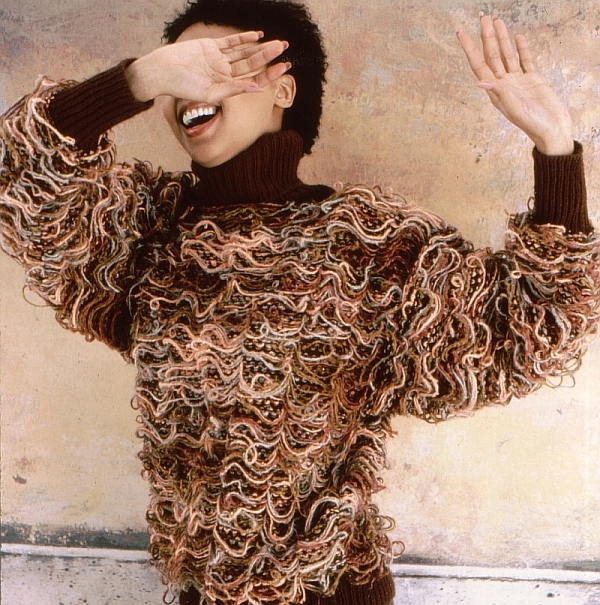 Flow was a one-of-a-kind sweater, which sold within hours of being shown (back in the mid 1980s when I showed at craft markets). The fabric was intentionally designed with super long floats, and it was probably a dangerous garment to wear. I hope the sweater is still around somewhere. The inside of this sweater looked similar to technical face of fabric #5. Last there's fabric 6, a double knit jacquard. That person who really liked the pattern on the inside of the cardigan (the far right in fabric #6) actually chose the side that's usually used commercially as the right side. Textile designers will often call this side of the design as the "face". It's the side of double knit jacquard with the clear pattern. Any pattern on the other side is often muted or striped in some way or just a solid color and is often referred to as the "backing". It was the backing that I chose to use as the "right" side for the Shawl Collar Cardi. 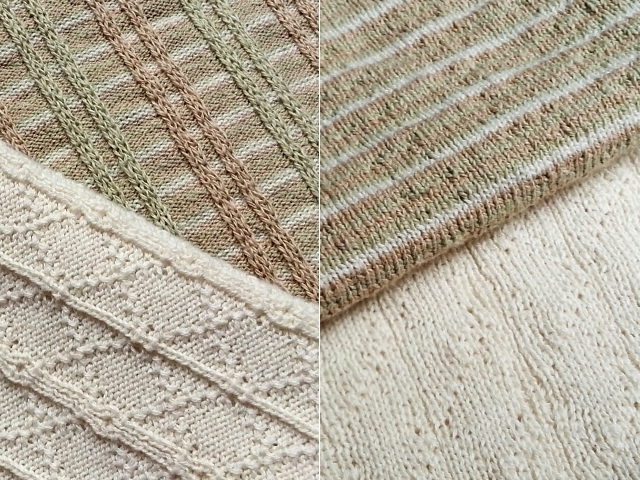 Perhaps this 3-part series ended up being more than any non-designer cares to know about knit textiles, but I do hope I've encouraged anyone reading this to have fun with the knits that you do come across in your sewing adventures. And if you like the "wrong" side more, flip it over, and make it your "right" side! Your knits look so lovely - no matter what side you're looking at. That "floaty" sweater is amazing. But I could see how one could get really get into a snag problem, especially if you were near any sharp objects! Thank you so much, Chuleenan. The "floaty" sweater was originally designed for display purpose only. I designed similar sweaters with long floats that were cut to become fringe. My display apparatus was late in arriving that day and the sweater was folded on a table. Someone really liked it!